I love this routine. 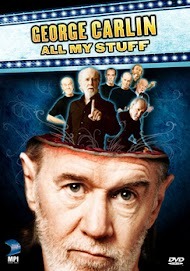 (I recommend you watch target=”_new”>the whole thing because it is truly a great piece of stand-up comedy.) I’ve been thinking a lot about “stuff” lately because, as you know, we’ve been acquiring quite a bit of it over the last few weeks. I know a lot of families live in a very small place, and while our little condo definitely does not fall into the “large” category, I consider us to be very fortunate that our daughter is able to have her own bedroom, her own bathroom, and a “place for her stuff.” The problem is, we are running out of places for our stuff. I knew we’d get to this point and for the most part I’ve felt prepared to handle all the new stuff that we’d be accumulating. I pride myself in taking after my Grandpa Bobby who could incredibly maneuver things around so that he was able to fit entire piles of seemingly endless items into very small spaces. I guess he had to…he had so much stuff! But even with my grandpa’s genetics and the fact that we’ve been purging stuff for months, I finally looked around last week and came to the conclusion that we just didn’t have the room we needed. Our garage had gotten to the point where it was housing almost all of the overflow, but the stuff we need regular access to was being blocked by boxes or furniture, and it’s like one giant fire hazard in there. So, as all dads need to be able to do, I came up with a solution and moved it into action quickly: overhead storage. I know it’s not exactly rocket science I came up with there, but solutions don’t need to be original if they are good. And this one is. I now have almost 2,500 cubic feet of storage available above my head in our garage. I literally cannot wait to put all our never-accessed bins of stuff from college, high school, and past relationships up there and start using the garage more efficiently. Great! Now you can come over and take all of Alison’s boxes of little girl “stuff” out of OUR garage! I’m sure there are lots of goodies in those boxes that Baby Girl Friedman would like to have now! No, but we did consider leaving Princeton in there while we’re gone. Yes….Grandpa would be proud indeed. Now, good luck storing all that “stuff”! Have you considered using the storage devices as multiple playpens, leaving you that room for stuff?